Can you please offer help for the PRTG setup wizard Commercial License Key screen? In order to run a commercial edition of PRTG, you need a commercial license key. 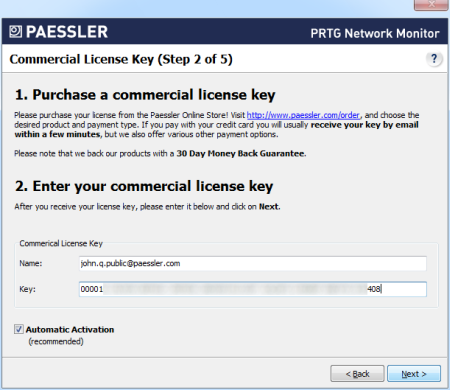 Please visit Paessler's online shop to buy PRTG and enter the license key information into the respective fields. If you have already purchased a commercial license, you can skip this step. Please visit the Paessler online store at http://www.paessler.com/order and chose the desired product and payment type. You will receive your license key via email—if you pay with credit card, usually within minutes. Your purchase is risk-free: Paessler offers you a 30 day money back guarantee in case you aren't fully satisfied with our product. You should have received your license key via email after your purchase. In order to re-send your license information, please log in to your Paessler customer account. Once you've received your license key, please enter name and key into the respective fields. Name and key have to be written exactly the way they are stated in the email; so we recommend using copy and paste. The Automatic Activation option will activate your product automatically via an existing Internet connection on first startup.